From mouth-watering Amish-style main dishes to kitchen dream desserts, this on has it all. Over 600 from-scratch recipes that please the appetite and are easy on the food budget. You'll get a whole section on canning and food preparation. The Amish, long known for their originality in the kitchen, share their favorites with you. 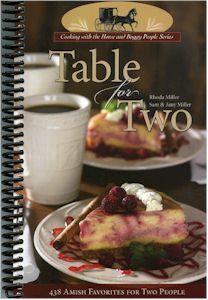 This 275 page spiral bound cookbook has over 600 recipes. Taste the old fashioned goodness of Amish style chicken, experience the delight of mouth watering apple pie. 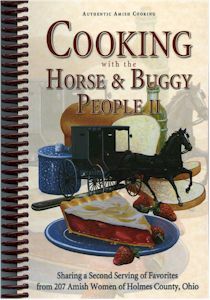 If you want authenticity - then get a piece of homemade goodness - Cooking with the Horse & Buggy People II. This 320 page spiral bound cookbook has over 600 recipes. All the favorites of the Belle Center Amish Community. Over 600 of today's family favorites, and even some from Grandma's kitchen. All the usual sections are here. 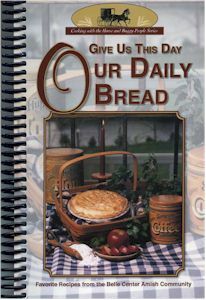 But what makes Give Us This Day Our Daily Bread special is the appetizers, large quantity recipes (for weddings, reunions, and other special occasions) and the children's recipe section. The tips, hints, and quotes section is filled with everyday kitchen secrets. Laminated cover - Spiral bound - 263 pages. Table for Two sets the table with all the Amish food favorites--just for two! Sam and Amy Miller and their extended family have shared 438 of their best recipes in helpings that won't leave a week of leftovers if there are only two at your house. Mouthwatering food, for just the two of you. Laminated cover - Spiral bound - 207 pages. Here's a chance to experience the wedding of Amish bride Miriam Miller. Relax and sip the drink served at her bridal table. Enjoy the hearty main dishes and mouthwatering desserts served to her 500 guests. Miriam shares glimpses into the wedding as she talks about the preparation and serving of food on her special day. 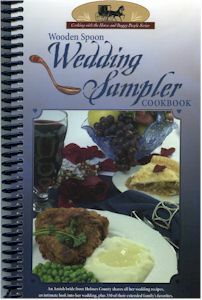 The icing on the cake with Wooden Spoon Wedding Sampler cookbook is that Aden's (Miriam's husband) family members have opened their recipe boxes and shared over 350 of their family favorites! Laminated cover - Spiral bound - 240 pages. Experience the homemade goodness of Amish canning recipes which have survived the test of time. 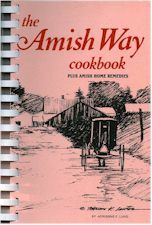 These wonderful recipes have been handed down through generations of Amish homemakers who have graciously agreed to share them with us all. Included in Canning the Amish Way is a section of Amish Home Remedies, a handy reference for treating simple health problems with natural substances. 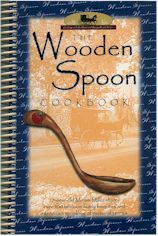 This excellent collection of authentic Amish recipes will be a treasured addition to any cookbook collection. Includes Amish home remedies. 217 pages, 5-1/2" x 8-1/2", comb bound, illustrated. Here's an intimate visit to the Amish home and food of 17-year-old Miriam Miller. Miriam's mom, grandma and aunts open their recipe boxes here. In addition to sharing her families favorite authentic time-tested recipes, Miriam shares childhood memories, stories, and personal details of her life as a young Amish girl. Take a walk through Miriam's life with art and stories about her home, and everyday activities. 194 pages. 5-1/2 x 8-1/2" spiral bound. Laminated cover. double indexed. 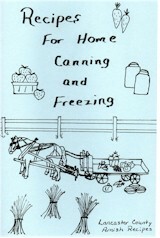 The Amish authors of Recipes for Home Canning and Freezing have dedicated their book to anyone who wishes to do their own preserving. They have made the recipes understandable, after all, they were taught by their mothers instead of out of a book. Contains approximately 100 recipes for pickles, relishes, vegetables, fruits, jams and jellies from Lancaster County, Pennsylvania. 36 pages, 5-1/2" x 8-1/4". The Harvest Table offers a delicious collection of Amish recipes plus a generous portion of new, mouth-watering, fresh vegetable dishes. A tasty selection of appetizers, soups, salads, casseroles, and main dishes plus delicious Amish breads, meat dishes, and desserts. A wonderful addition to any cookbook collection. 109 pages, 5-1/2" x 8-1/2", spiral bound, illustrated.